Even the most stalwart food tinkerer can fixate on a single dish; indeed, it’s our calling card to cooking. For me, it was fermented green beans. 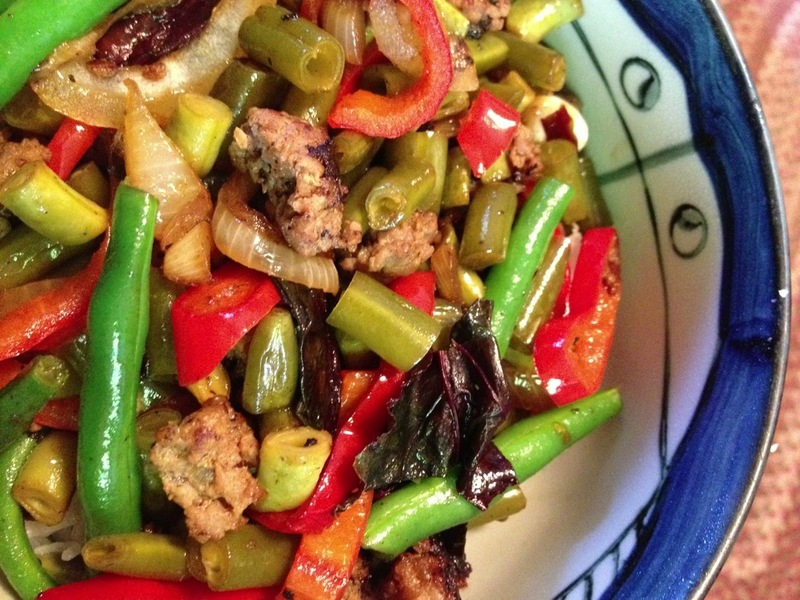 I couldn’t resist the soured, greenbeany niblets of long beans in a Sichuan dish I had in Cambridge’s Kendall Square (the now sadly defunct Thailand Café) last spring. Long beans are what string beans fantasize of being. Sometimes called yard-long beans, they are good in Thai and Chinese stirfries. I often use them in curries. So sour grapes, er, rather, sour fermented beans were definitely a goal. Minced pork with sour beans is a well known Sichuan dish, so as soon as I returned home, I made quicklike for my Fuchsia Dunlop library and immediately put up a quart of the beans in the manner she suggested: full of warm spices and punchiness like rice wine, ginger, star anise, Sichuan peppercorns, etc. The alcohol inhibited the fermentation, so it turned olive grey and salty, but never achieved the sourness I was seeking. The ginger tasted weird. The other spices were a distraction, but I wasn’t sure if they were the problem. So I tried again without alcohol and ginger. Still bad. So I tried yet again, but this time sticking with the pure flavors of beans and salt. Much better, but I had been keeping the beans whole, which created an odd, rubbery texture. I had thought that it would help them stay intact and not quite so salty, but the tradeoff was not worth it. And since Germans slice and pound beans in the fermentation process for sour string beans (and when have the Germans done anything wrong? ), I thought I’d give it a try. In the final batch, I chopped the beans into small pieces. I added quite a bit of garlic, and there they were: delicious, sour, flavorful beans. They were indeed a bit salty, so rinsing or soaking them before stirfrying them and declining any more salt or soy sauce in the dish is a good idea. The longer they sit in the refrigerator, the saltier they will get. 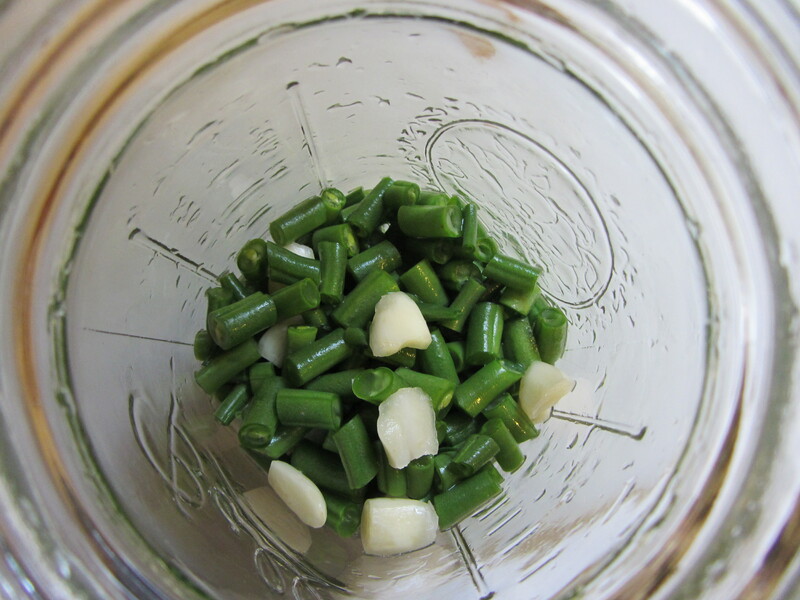 I ended up quickpickling more beans in the remaining brine, and they were good, too. The soured beans were stirfried with some fresh green beans, ripe red pepper, and a beautiful variety of burgundy leafy greens sourced from Good Food Easy and Adaptive Seeds along with the minced pork. No other seasonings needed except for a cube of frozen chicken stock for sauciness. Delicious. Chop beans and peel and smash garlic. Add to jar. Mix up a brine with one quart of hot water and sea salt, stirring to dissolve salt. Pour brine over beans, add optional fermented juice, weigh down beans with a weight or similar so they are submerged in brine, and let sit on the counter for 5-7 days. Taste for sourness. When they are sour enough for you (I probably went for 9-10 days, in all honesty), refrigerate and let cure for a week before enjoying. Rinse or soak beans to remove some of the salt before using in a stirfry. I snapped a shot of these quick pickles the other day because they were so cute. Made with tiny mouse melons, a.k.a. Mexican sour gherkins, a.k.a. cucamelons, a.k.a. Melothria scabra, I just cracked them open and lo and behold, these might be the best cornichons I’ve ever had, so I had to jot down the recipe. The natural lemony tang in the mouse melons goes wonderfully with the tarragon, and the little guys stay crisp after a day or two in the brine. If you’re growing these, you are sure to have tons of them like I do, so definitely put up a jar or two. 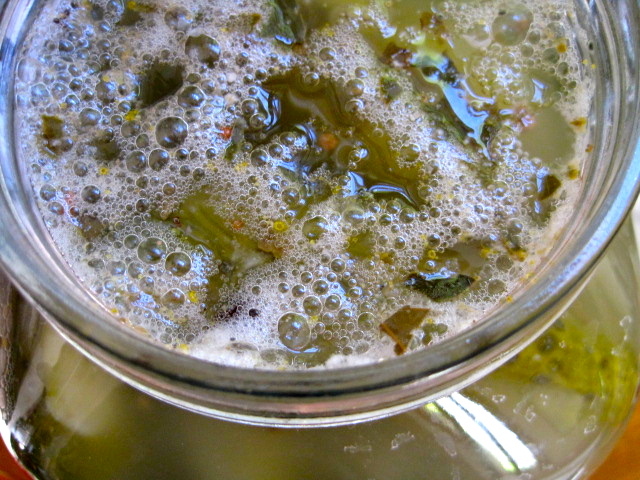 I simply used leftover brine from making dilly beans and two fresh sprigs of tarragon. 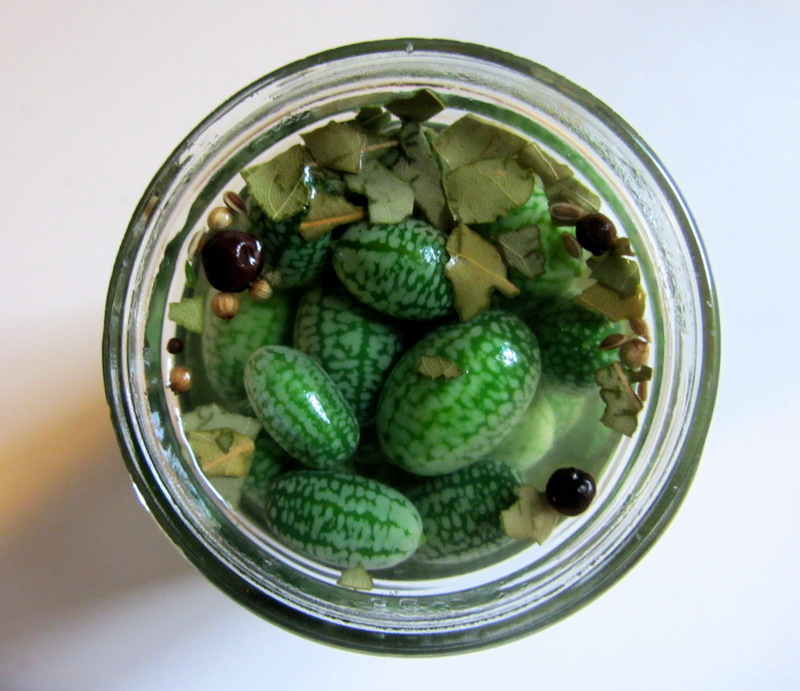 If I had had more, I would have tried lacto-fermenting mouse melon cornichons. I made some really excellent ones with small pickling cucumbers this year, so I was kind of already full up anyway. Edited to add: The lacto-fermented cornichons were great. A different taste — more deeply sour and less sharp, with a pronounced mouse melon flavor that’s hidden by the vinegar in the quick pickle. They are holding up nicely with a couple of grape leaves in the single half-pint jar I put up. Alas, the quick pickles turned mushy after a couple of weeks in the refrigerator, so be advised that you want to stick with the idea of “quick” with these guys. A friend processed the quick pickle recipe at around 7 minutes, and his are holding up, though, so more experiments are in order if we want a shelf-stable vinegar pickle version. Heat salt, water, and wine vinegar to a boil in a nonreactive saucepan. It will make too much brine, so use the rest for quick pickled cucumbers or cauliflower or peppers. Remove from heat. To your jar, add the mustard seeds, pickling spices, tarragon, and garlic, then add the mouse melons. Top with hot brine and seal. Let cool on the counter, then refrigerate. Serve with sliced meats or cheeses and your guests will die of cuteness. If there’s any specialty of this blog, it’s not gardening or sustainability or Northwest politics or seasonal cooking or local cheerleading or events or complaining a lot. It’s pickles. We’re not quite at that magic time of the year in Oregon yet, but I see from the hits on my blog that other places in the country have hit pickling time with a vengeance. Suffice it to say, I always have pickles on hand, and I spend the whole year pickling. Throughout summer and late into the fall, I put up crocks and crocks of red and white sauerkraut. Some of the sauerkraut I can and give as gifts, and other jars I leave fresh in the refrigerator, where they last for months. Also for winter eating, I make crocks and jars of fermented and vinegar dill pickles with giant bags of perfectly sized cucumbers I buy at a local farm and my own horseradish or grape leaves, plus full heads of garlic. I make dill relish every other year. 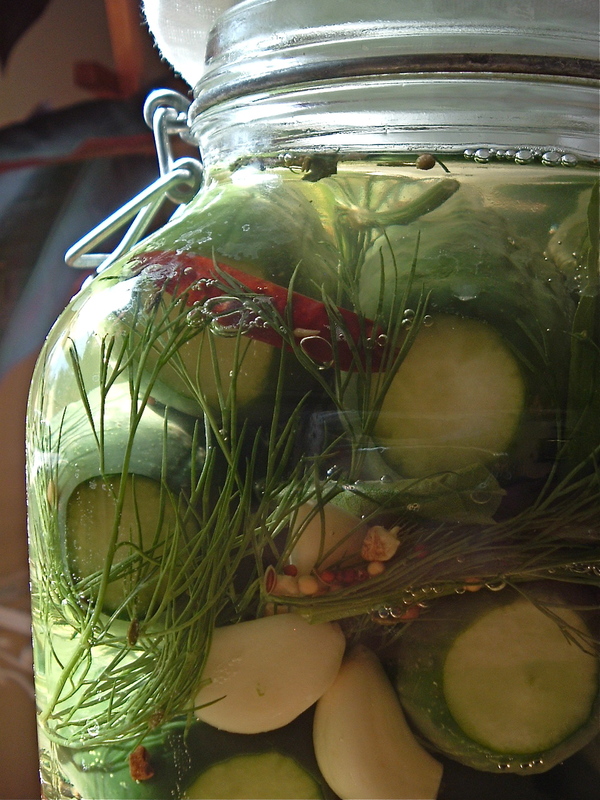 The fermented dill pickles have delicious juice that I use all year ’round in potato salads, as a marinade for salmon, and to deglaze pan-roasted fish or shrimp. In autumn, I restock my tomatoes, salsa, and ketchup supplies. As it gets colder, I turn the rest of the green tomatoes into pickles or salsa. I used to use all my sweet and hot peppers to make the pepper-eggplant spread ajvar (for freezing) but my new tradition is to put up a few half-gallon jars of hot peppers to ferment and make hot sauce after many months of fermentation. In winter, when I see the citrus fruits at their best, I make a couple of jars of salt-preserved lemons and lemon zest vinegar (to use in a pinch when I’m out of fresh lemons), and, occasionally, marmalade. I turn a 5-lb. bag of local dried Fellenberg or Brooks prunes into pickled prunes, to eat with winter roasts. I stew some of the sauerkraut in Pinot Gris (and save the Riesling for drinking — life’s too short to waste good Riesling) and eat it with kielbasa and other smoked meats. If I remember, I corn a brisket for St. Patty’s day in March. I make mustard and horseradish relish from my horseradish plant’s roots. It’s hard to believe, but we eat them all. Here are my pickle recipes, indexed, if you’d like to try some or all of these ideas! All of the canned pickles are produced using tested, safe recipes that are approved by the Master Food Preserver program, with which I’m a certified volunteer. 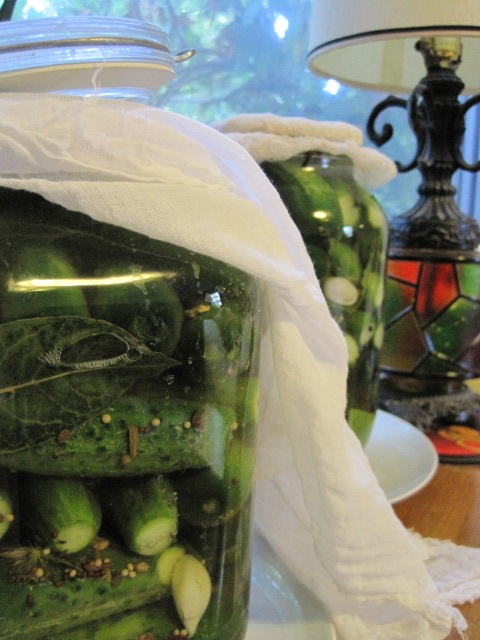 The fermentation recipes are not USDA-approved, but I have made them all many times. Well, I made it to Indiana, and I’ll be here for a week or so, working on my book at the Kinsey Institute, before heading to a conference in Ohio and a visit with family. Before I left, I made a great saag paneer dish with the rest of my collards and cilantro, which were bolting, and beet greens from the lovely beets we’ve been getting in the market. 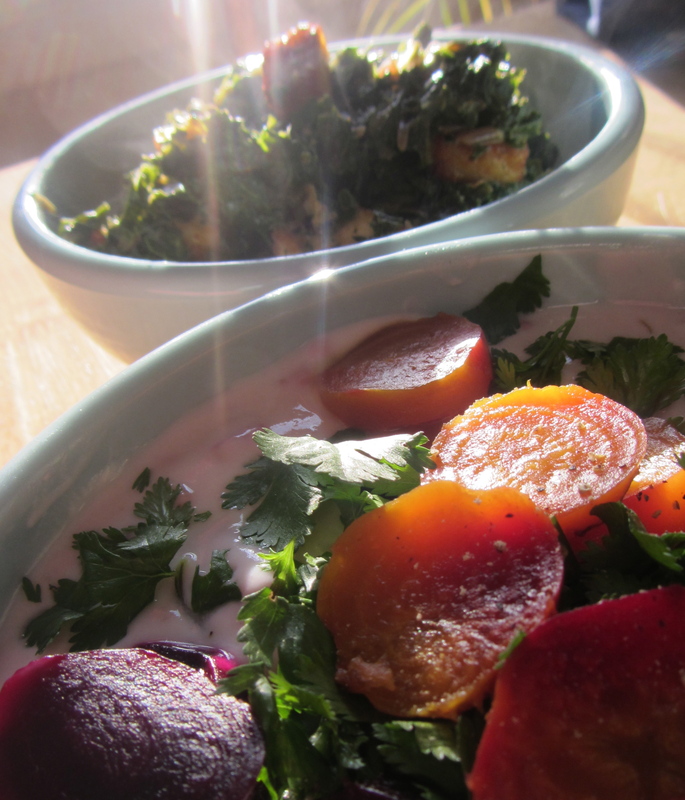 Beets are wonderful because you can use all their parts — greens, stems, roots. I mentioned the beet stem relish I made a few weeks ago (recipe below), but I wanted to discuss a nice bonus that comes from the pickling process: pickled mustard seeds. Pickled mustard seeds are wonderful, and so easy. I like to add them to any salad or salad dressing where I’d normally use sharp whole-grain mustard. They add a delicious crunch. Because they’re preserved in vinegar, salt, and sugar, and are meant to be cold, fresh, and lively, they keep well in the refrigerator for a couple of weeks. As they sit, they get stronger. These are not meant for processing. The flavor is sweet and sour. Adjust sugar per your fancy. Yellow mustard seeds (as opposed to the brown or black ones, which can be bitter in this preparation) are best. They can be most cheaply purchased in bulk at a health food store or Indian market. The brilliant salmon color of the ones above are due, of course, to the dark red beet stems. You could slip a sliced beet in your pickle to mimic the color if you like. 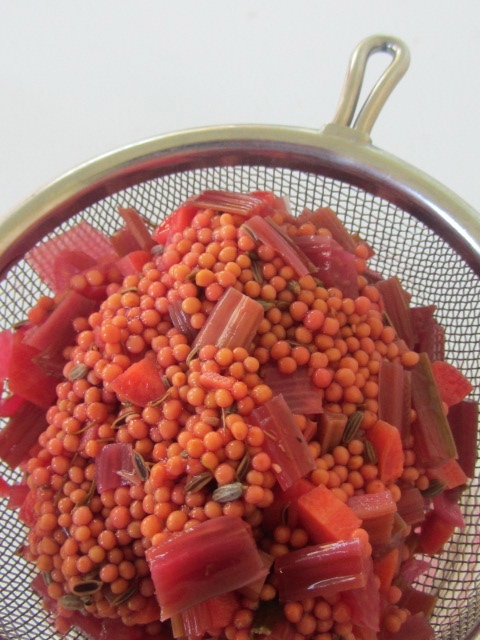 I’m including two recipes, one for the beet stem relish and one for plain pickled mustard seeds. Enjoy! Trim the leaves off the beet stems. Rub the stems under running water to remove all traces of mud. 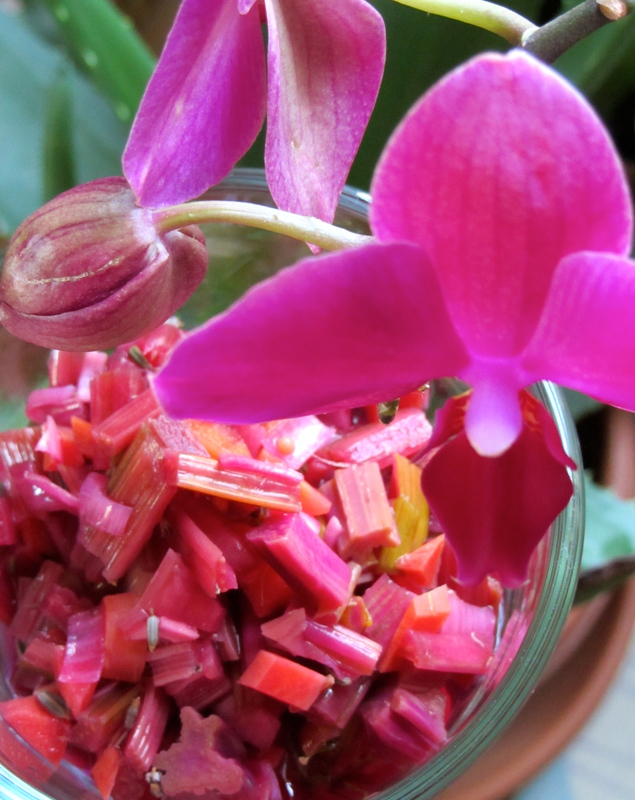 Finely chop the stems — this is important, as they will be tough and stringy in larger pieces or batons. Chop the onions and carrots in similar pieces. Wash and sterilize two pint jars (I pour boiling water into the newly washed jars, or you can take jars immediately out of the dishwasher.) Combine vinegar, water, sugar, salt and spices in a small saucepan and bring to a boil, stirring to dissolve sugar and salt. Scoop out spices from the brine and add to warm jars. Add raw vegetables to jars, pressing down gently so they are packed generously but not too tightly. Pour boiling brine in jars up to about an inch from the top. Cover with plastic lids or metal lids protected by a layer of plastic wrap (so the lids won’t corrode). Let sit on counter until cool, then refrigerate for at least a few hours before eating. Pickles will keep with excellent quality for about a week. Wash and sterilize one pint jar (I pour boiling water into the newly washed jars, or you can take jars immediately out of the dishwasher.) Combine all ingredients in a small saucepan and simmer for 30 minutes, stirring to dissolve sugar and salt. Remove beet slice. Let cool and store overnight in refrigerator. Keeps in refrigerator for weeks. Raita is a cooling Indian condiment made from yogurt and spices and the occasional vegetable like cucumbers, carrots, or, as I discovered, beets! I used about a 1/4 cup of beet stem pickle for 2 cups of plain, full fat Greek yogurt, then folded in a few shakes of cumin, coriander, and white pepper. Salt to taste, then add a 1/2 cup of sliced or chopped roasted beets and a handful of chopped cilantro. come on down to earth: fermentation demo today! FERMENTATION ROCKS! The next talk we’re having in our food preservation series is covering fermentation. From dairy to veggies, beverages, soy, sourdough and of course sauerkraut, there will be plenty of information to share. This free talk is hosted by master food preservers from the OSU Extension Service this Saturday 9/24 from 1:00-3:00pm @ our Olive Street store. Stop by with any questions you may have and or share your own fermentation story. One of those Master Food Preservers is me! We’ll be discussing fermentation and safety, and serving up radish kim chi, sauerkraut, and more at this free demo. Stop by and see us this afternoon. We’re nearing the end of peach season in this long, late summer in the Willamette Valley. If you find yourself with a glut…nah, heck, if you have even a small amount of peaches or are tempted to go out and buy peaches, save some for this chutney. Sweet and spicy with brown sugar, cider vinegar, a ton of fresh ginger, and mustard seeds, I punched it up even more with a new local product, my friend Polly Wilson’s Hell Dust. 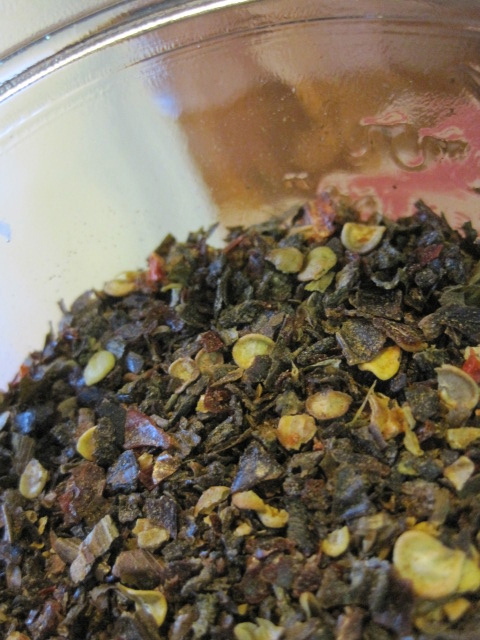 Hell Dust is a dried spice blend made from Polly’s own hot peppers, smoked over a wood fire and ground down into flakes. Couldn’t be simpler. What I discovered was that it provides a smoky flavor to anything that it touches, and the heat stays hot in canned products, unlike other hot pepper flakes that dissipate. Yes, it’s HOT. It’s similar to dried chipotles, but she uses a blend of green chiles (and red?) that have a richer diversity of flavor. 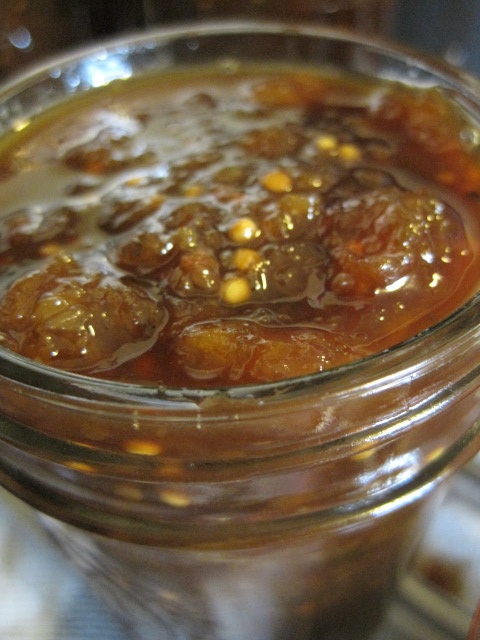 The chutney is easy to make: you chop up the ingredients and cook them down for an hour or so until rich, caramel brown. It can be canned or frozen. Save some for right now; I couldn’t wait. Fabulous with any roasted meats, spinach or garbanzo bean curry, cheese sandwiches, plain white rice, pilafs. I even used it as a salad dressing last week. I think I’m in love. This recipe is based on Linda Ziedrich‘s recipe in Joy of Pickling and the less gingery recipe in So Easy to Preserve. Pulse onion and garlic pieces and raisins in food processor until finely chopped. Peel peaches by submerging them whole in boiling water for 30 seconds, then plunge in cold water. Skins should slip off. Eat the skins! Pit peaches and coarsely chop them. Add them to large pot for the chutney with the onion mix and rest of the ingredients, and mix well. Simmer mixture 45 minutes to an hour until deep brown and thick. Wash your jars, rings, and lids, and heat the lids according to the package instructions. Spoon the hot chutney into jars, leaving 1/2-inch head space. Remove air bubbles from jars by tamping gently on the table. Wipe rims of jars carefully and adjust lids and rings. Process in a waterbath canner for 10 minutes, then store in a cool, dark place. Unfortunately, they’re in my bedroom. It’s the only room in the house with a window A/C unit, and even though the house is shaded well and insulated, a stretch of 90-degree weather can mess with my fermentation. So I’ve got 10 lbs. of sauerkraut daintily burping in a crock on the floor and two gallons of dill pickles and a half-gallon of fermenting hot peppers perfuming the air atop my cedar chest. All I need is a few urchins in rags and a line of laundry across the ceiling to complete the look. iron chef eugene finals 2015! the skies are falling! ethiopian food in eugene! iron chef eugene 2015: allez cuisine! food symposium and a few spots left in my writing workshop on saturday! Get 'em while you can: Interested in free publications on preserving just about anything that grows in Oregon? Extension offices in the PNW have worked together to create a research-based library of resources, now available in .pdf form.